Always download the latest GIT version, not the latest official version, when using these cheats. Many things have changed since the last official release. So before you ask for help, UPDATE! 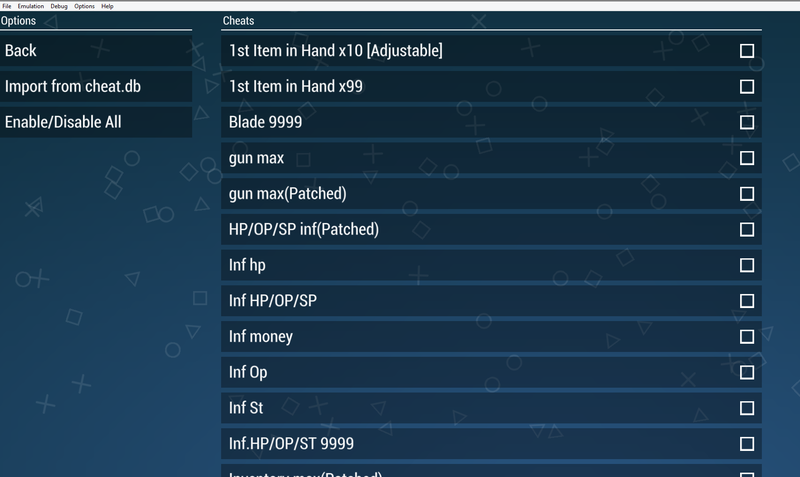 Cheat folder Path: "main PPSSPP folder\memstick\PSP\Cheats"
From the Cheats menu, you can activate and deactivate your cheats. Additionally, there is now the option to import cheats from a cheat.db file. 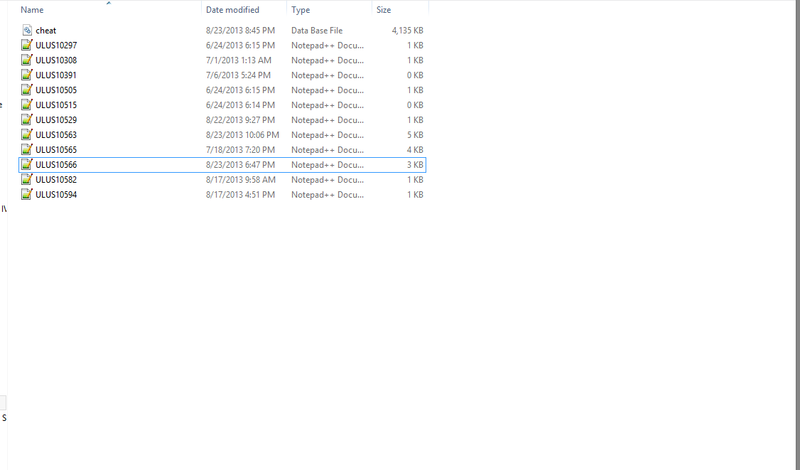 If you have a cheat.db file, place it in your /cheats folder. PPSSPP will search for your game by its UID (like ULUS-10202) and then proceed to add the codes to your game's cheat ini file. Note: If your game crashes after enabling cheats and loading the game, then you must manually create the "Cheats" folder in the /PSP/ Directory. On windows, if you have everything set up properly, but ppsspp isn't loading your cheats menu at all, you may have to try moving your PPSSPP folder to the root of your C:\ Drive. Try this first, and if it works, you may be able to move it to another folder. Do not use the Desktop or My Documents folders. Edit: Updated to reflect the new format. I think this should be sticky so anyone can add their cheats here.What do you think? Well, we may be adding cheatdb support, which will contain pretty much all available cheats already. Most CWcheats can be found around the web though. No need to muddy up this thread. Yeah the problem is that it's going to require a UI to make it usable. Otherwise its just gonna be a big mess Unfortunately, i've never written a GUI before, which is why it hasn't been added in yet. v0.7.6-772-g2bf1beb is which ver. I'm using, but there is no such option in Settings/System nor do I see a cheats folder to appear upon opening game. You have to build the separate branch on github. Can you explain how that is done? I don't know about anyone else, but I don't exactly have much experience with ppsspp or github, so I have no clue what I'm doing. Oh that's wonderful. I've been thinking about today. so it's not been released as a build yet ? You have to build it yourself or wait for the autobuild. I would link mine here but I don't know if that's against the rule or not. Providing custom builds isn't against the rules, but since PPSSPP is GPL'd you have to provide the source code with the binaries, or provide a link as to where it can be obtained. Also out of courtesy you might want to provide a virustotal scan of the exe files. Okay. I got my files off github. What I built was just the normal master branch only after cwcheat had been merge with it. So I didn't do anything other then download it and build it. Just put the exe in a ppsspp folder or heck, make a new folder and copy only the folders and the at3 dll from your most recently used ppsspp folder into it along with the exe you download and just follow the directions in the original post. It's 32bit. Thanks for uploading. Orphis buildbot seems to be down today for some reason. Let me know if you find any bugs.